I don’t care for zucchini by itself, but like most people I’ll take it baked into bread. This recipe for Whole Wheat Zucchini Bread is particularly good and has some nutritional value as well. The original recipe is from Jane Brody, but as usual I made some changes. Instead of using half whole wheat and half white, I used King Arthur’s White Whole Wheat. I also drained the zucchini on paper towels for about 10 minutes, which may have been why the batter was so very thick. Not that it was a problem, because the bread was very good in the end. It had a soft, not-too-sweet interior and a lumpy, bumpy, almost cookie-like crust. Hopefully Fuzz will eat some for her snack. Finally, I’ve started toasting nuts in the microwave again. Every microwave is different, but I’ve found that if I put a handful walnuts or pecans on some paper towels and toast for 1 minute and 40 seconds at 50% power, I get nicely toasted nuts. Sometimes I use 40% power, depending on the nuts. Pecans are better at 40%. The trick is not using full power because in modern microwaves, nuts tend to burn. It might take some experimenting with different power settings on your microwave, but you really can toast small amounts of nuts in it if you figure out the right setting. 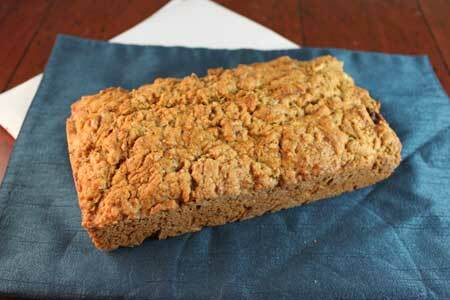 This whole wheat zucchini bread recipe has less fat, less sugar and more fiber. Preheat oven to 350ºF. Spray a 9x5 inch loaf pan with flour-added baking spray. Lay the zucchini on a stack of paper towels. Press out some of the moisture and let it stand for about 10 minutes. In a large mixing bowl, thoroughly stir together the flour, sugar, baking powder, soda, salt, cinnamon, cloves and nutmeg. In a medium bowl, stir together egg white, whole egg, oil, zucchini and vanilla. Add this mixture to the flour mixture, stirring to combine them well. Stir in nuts. Pour batter into pan. Bake for 50 minutes or until a toothpick inserted in the center comes out clean. Thanks Connie! I’ve been collecting them for a long time — some are better than others. Louise, I let them expire because my daughter is going to be selling them for school in a few months and I have to buy as many subscriptions as I can so she can win a prize. Oh, and it helps the school. Feel free to guest post if you find a compelling dessert in BA. I haven’t in the past couple of months. I thought you might make one of the great looking treats in the current Bon Appetit. Why did you let the subscriptions expire? My husband always complains that my food magazine subscriptions are a lot more expensive than his car and motorcycle subscriptions. I have found baking nuts in the oven while it’s preheating they come put perfect. I turn on the oven for a recipe and set the timer for about 8 minutes, the nuts are perfect and the oven is preheated and ready to go. I take my nuts straight from the freezer (where I store them to keep them fresh) and toast them in the toaster oven. One medium-dark toast cycle and they’re perfect. That way I don’t have to watch them. Must try your microwave trick. And must make zucchini bread! Yum! Sounds great, How do you feel about chocolate-zucchini combinations? I toast my nuts in the microwave too. I tend to burn nuts in the oven or on the stove. But never the microwave, for some reason. No, just kidding. It’s a valid question. @Anna — So if I understand correctly, what you’re trying to say is “Adam, stop over thinking everything” :). I thought I was done with zucchini baking, but my SIL gave me two more big ones that I need to use up. I made a zucchini bread a couple weeks ago, but it sunk in the middle and I hate it when that happens (though it still tasted fine). I like the idea of the crisp outside and just might try this. Adam, I used “generous” tablespoons. The original version was just tablespoons. Also, my generosity with the oil may have added an extra teaspoon at best. I probably shouldn’t have even mentioned it. Also, I used regular vegetable oil — Wesson Oil, I think. Maybe Crisco. Not sure. It wasn’t canola, though. I’ve been looking for a goto Zucchini bread recipe, as I have a very large zucchini in my fridge right now. Unfortunately, it’ll probably be used up before I have a chance to try any recipes (moving soon, no time to bake). Though I have to say, this is a very interesting recipe just reading it: having both Baking soda, and powder but with no added acids. And the fact that it would recommend “generous tbsps” of oil since 6 standard tbsp (if not less) is proportionate to a recipe of this size. But I too love the look of that top crust, which automatically puts it as front runner :). Though I’m curious if you would have gotten the same top crust if you hadn’t drained the zucchini, since you would have had so much added water. Regardless, it looks great, and I’m hoping that I’ll be able to try it out :). One question Anna, did you use a neutral vegetable oil or standard? I love quick breads with a crust so I’d probably like the cookie like exterior. The contrast in texture is unique and welcome in my opinion. Sadly if you get a crust it usually disappears once you store it. Hopefully Fuzz will like this for her snack. This bread has an interesting look to it and what’s not to like about a cookie-type crust?? Plus it hides some vegetables (botanically a fruit) ! I entered zucchini carrot bread in the state fair competition once. I thought it tasted great, but it left something to be desired in the looks department.